'Be Young' out NOw on LP/DIGI/CASSETTE!!! Discover LA - #EveryoneIsWelcome - "Bloodshot Eyes" + "Hands & Eyes"
GET AN EARLY LISTEN OF OUR NEW RECORD OVER AT KCSN!!! 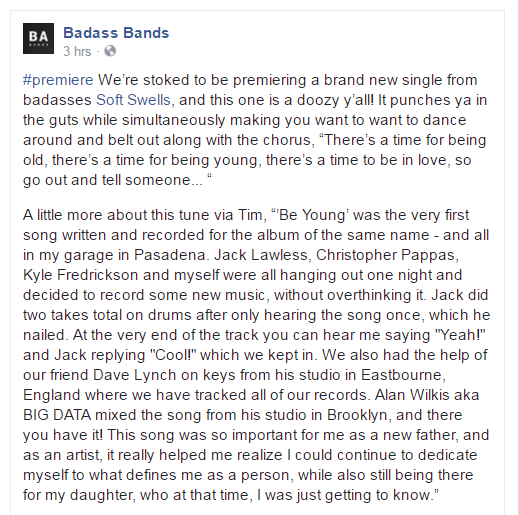 Badass Bands title track premiere! "Lights Run" video + song premiere via Buzzbands.LA! Watch the video premiere of "Reins" right now! Treat yourself to some #FreshNoise from Team Coco!! !